At the Potomac River Convention, we shall sing from The Sacred Harp, 1991 Edition. Click on the photo above for an enlarged version (46K). The 1991 Edition (the successor to the Denson Revision) is the more widely used of two major editions of The Sacred Harp in use today, particularly in the north and central regions of Alabama, Georgia, and Mississippi, and among the many Sacred Harp singers outside the South. 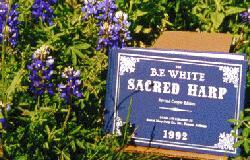 In the lineage of Sacred Harp editions, it is a descendent of the 1844 tunebook The Sacred Harp by B.F. White and E. J. King and the 1911 revision called Original Sacred Harp compiled by Joseph S. James. More immediately it is a revision of, and successor to, the Original Sacred Harp: Denson Revision (1936). 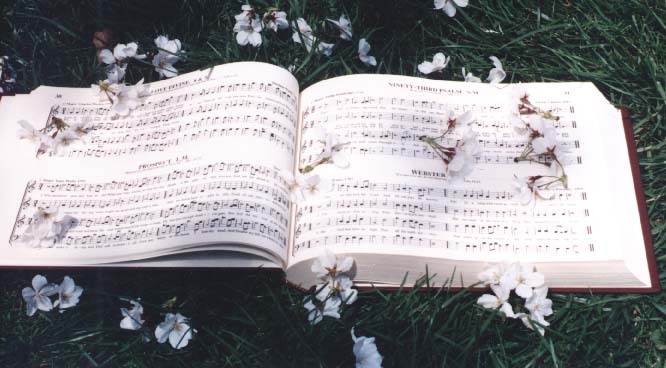 To compile the 1991 Edition, a music committee of prominent Sacred Harp singers chaired by Hugh McGraw added 62 songs and deleted 46 rarely sung older songs and anthems. The added songs include late 18th- and early 19th-century classics of New England and Southern origin and new songs by living composers from the South, Northeast, and Midwest. This edition/revision is still frequently termed the "Denson book" by many Sacred Harpers, but this is incorrect in a strict sense, because the music committee for this major revision did not include members of the Denson family, and the ownership of the publishing company was (and is) no longer concentrated in the Denson family. The 1991 Edition was realized through the leadership of Hugh McGraw, the dynamic Executive Secretary of the publishing company from 1958 to 2002. The scores of all 554 songs were entirely retypeset for easier legibility. Sources and dates of tunes and texts were revised to reflect modern scholarship by Professors Warren Steel and William J. Reynolds. There is a new Rudiments section relevant to modern singers by John Garst. This edition has been very enthusiastically received by the Sacred Harp community as well as by hymnologists. ISBN 0-9727398-0-7. Order from the Sacred Harp Publishing Co., c/o Philip Denney, 208 Oak Grove Road, Carrollton, GA 30117. Prices as of January 2019: The price of one-five books is $25.00 per book plus $5.00 for shipping for the first book via USPS to U.S. addresses. Shipping for additional books after the first (up to four) is $2.75 per book. The price of a case of six books is $150.00 per case plus $15.00 for shipping of one case to U.S. addresses, including insurance and delivery confirmation. Shipping for additional cases is $12.75 per case. Larger orders must be in multiples of six books. For shipping via USPS to international addresses, the price is $190.00/case including shipping. More details are on the ordering page of the publisher's website. Make checks payable to the Sacred Harp Publishing Company. Ordering via PayPal with a credit card is available through buttons and a shopping cart on the ordering page. Photo of 1992 edition by Al Rogers copied with permission from Gaylon Powell's Sacred Harp Singing in Texas Web page. The Sacred Harp, Revised Cooper Edition, 2012. 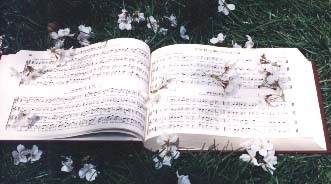 The "Cooper Edition" is a tunebook descended from the 19th-century Sacred Harp and initially published in 1902 by W. M. Cooper. This Edition has been periodically revised by a different circle of singers and their families from those who produced the Denson and 1991 Editions described above. It has been traditionally used in the Florida panhandle, the southern regions of Georgia, Alabama, and Mississippi, and in Texas. It is also used by black Sacred Harp groups in Alabama. Nationwide interest in the Cooper Edition (informally known as the "Cooper book") has increased dramatically in recent years, and currently there are Cooper Edition singings in nearly all regions of the U.S. The Cooper Edition has many songs in common with the Denson/1991 Sacred Harp (sometimes with different alto parts and titles) but also many other mid- to late-nineteenth-century songs having a relatively sweet harmony, including "call-and-response" songs. It also has a number of beautiful "folk hymns" not in the 1991 Edition, and several contemporary songs. Many Sacred Harp singers attend both Cooper Edition and 1991 Edition singings and cherish the unique songs of each tradition. The new 2012 Revised Cooper Edition represents a monumental cover-to-cover retypesetting of all pages by Karen Willard, a Seattle alto singer and shape-note music publisher. Improvements and corrections were made carefully to enhance singability and readability without altering the music or changing the character of the tunebook. Ms. Willard reports the following improvements: The dark blue hardbound 608-page book is 1/2 inch taller and 1/2 inch wider than before. The 612 songs (counting two in the Rudiments) include 12 newly added songs, 10 by currently living composers. No songs were deleted. All known musical and typographical errors were corrected. All remaining uses of "etc." were replaced with actual lyrics, and additional verses were added to 95 songs where there was space for more. Eleven songs were moved to different pages to allow more room for previously cramped songs. All alto parts are now in the treble clef rather than alto clef. The Rudiments section is now much more readable, and minor errors were corrected. The Tunename Index includes names used in the Denson/1991 editions where they differ from the those in the Cooper Edition. Finally, the name of the book itself was changed from The B.F. White Sacred Harp (the name used from 1949-2006) to The Sacred Harp , the name used from 1902 until 1949; however the former name is printed on the spine. Clearly everyone who attends Cooper book singings will want to buy a copy of this new edition. The base price is $20.00 per book regardless of the quantity purchased. Bulk orders are by case (10 books/case). Shipping charges (to U.S. addresses) are as follow: First book (or one book) $5.00; for additional books up to 5 books add $2.00 per book; and for a case of 10 books add $20. Inquire about shipping charges for orders to non-U.S. addresses. Make checks payable to the Sacred Harp Book Co. Address orders and inquiries to Ms. Victoria Aplin, Treasurer, Sacred Harp Book Co. Inc., 200 S. Johnson St., Samson, AL 36477, e-mail aplinbill-at-gmail-dot-com, phone 334-898-7253.